Nero Burning ROM of Ahead is versatile program and is even capable of burning so called ISO files. ISO files (files that have a suffix .ISO) are often found on the Internet and commonly created using CD-writer software by Adpatec. But it would we a bit of a waste of money and disk space to buy 2 CD-writer programs, specially when the one you've got (Nero) can do it all. 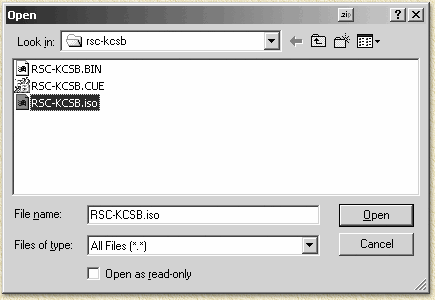 Simpely put, an ISO file is nothing more than an exact copy of an entire CD into one single file. Note: Read the disclaimer first! Copying CD-Roms can be illegal! So how do I write ISO files? If Nero starts with the Wizard the choose "Close Wizard", if Nero starts with "New Compilation" select "Cancel". 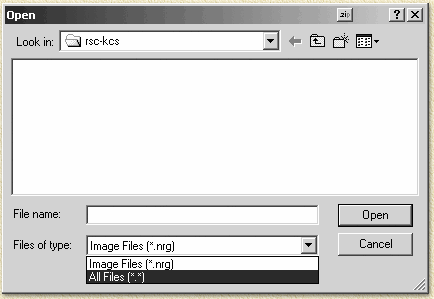 Now choose from the menu "File" - "Burn Image". 2. Choose files of type "All Files (*. *)" or "Images Files (*.nrg;*.iso;*.cue)"
The fileselector by default uses the Nero "Images Files (*.nrg)" filetypes, changes this to "All Files (*. *)" as shown below. Note: Newer releases (as of version 5.5.x.x) of Nero support ISO files instantly using the filetype "Images Files (*.nrg;*.iso;*.cue)". If you have such a version, then choose this filetype instead of "All (*.*)". 3. Select the ISO file and select "Open". Nero might now prompts you with the question what settings to use (newer versions will not prompt you if not needed). I have no golden tip on how to determine these settings. I always had succes by simply clicking "OK". 5. Check the tracks and start to burn. On the tab "Burn" you can start writing the CD by clicking "Write". Well, that's all you need to do to write ISO files with Nero ... isn't it simple once you know how?